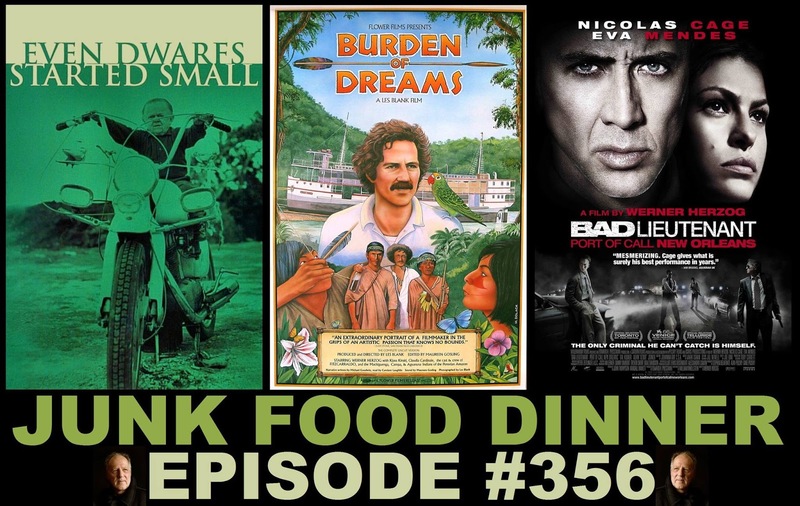 The THRILLING conclusion to our month-long tribute to ego-stroking concludes with our final Me-Arch episode: Sean Byron Presents: A Junk Food Dinner Tribute to the Film Legacy of Werner Herzog! Join along with us as we explore three flicks from the pleasantly grim madman of Bavarian cinema. First up! An early effort from Werner Herzog has him chronicling a particularly chaotic, if plotless, day in the life of a fictional band of dwarves out in the Canary Islands. The film of course is 1970's Even Dwarfs Started Small! and we're here to report that it does not skimp on the little people! Next! Making any movie is hard work, but Herzog finds ways to make them maddeningly difficult. Never before was this more obvious than in Les Blank's 1982 documentary Burden of Dreams, which follows Werner as he attempts to pull off the impossible while making Fitzcarraldo. And then the soccer ball goes flat! Finally, we end the show as we end all truly great shows: smoking crack rocks with Nicolas Cage in a gritty post-Katrina New Orleans. Or at least, that's what it felt like after watching this movie. It's 2009's Bad Lieutenant: Port of Call New Orleans, and it just MIGHT change all your thoughts on Nic Cage. All this plus witty banter between friends, chats about Julia Ducornau's RAW, The Plastic Dome of Norma Jean, the Sweetest Man in Washington DC, King Kong News, Godzilla News, Other Giant Monster News, sick animation burns, Parker's fear of emotional intimacy, continued apologies to Robert from Podcast Town, them weekly news and Blu-ray Picks, continued lack of overt police involvement, sneezes, belches, mega-decrepit erections, gleeks and a whole lot more! Also, if you like the show, please take a minute and subscribe and/or comment on us on iTunes, Stitcher, Blubrry or Podfeed.net. Check us out on Facebook and Twitter! We'll give Jason Robards amoebic dysentery for your love and support.